Pros Extremely durable and consistent. 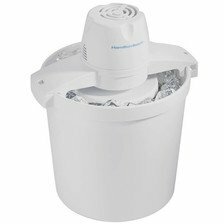 Unlike those of most competitors, its heavily insulated freezer bowl does not require any ice. Cons We recommend a longer freezing time than what the manufacturer suggests. 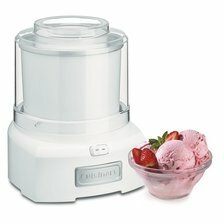 Summary The best ice cream maker on the market. Customers can count on this machine for consistent results time after time again. Pros We like the combined electric motor and hand crank - along with a generous quart capacity. Cons Takes a lot of effort for thicker ice cream. 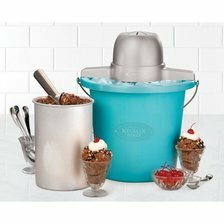 Summary If you're looking for a fun ice cream maker that won't break the bank, this one is a safe bet. Pros A must-have for making large quantities at a time thanks to a spacious 4 quart reservoir. Cons Requires prolonged freezing time. Summary Not ideal for the impatient consumer as it takes longer to freeze batches than its competitors. Pros Stands out for its simple yet competent operation, churning out frozen treats quickly and consistently. Cons It can be tough to get all of the leftovers out after processing the ingredients. 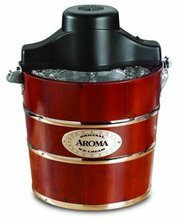 Summary This ice cream maker is an appealing choice for those who want cold treats almost instantly. 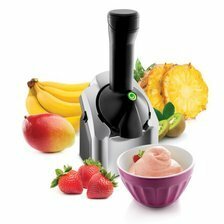 Pros A top choice for consumers looking for a reliable fully automatic ice cream maker. Cons Several customers gripe about its noisy operation. Summary It's challenging to find another unit in the same price range that matches the performance of this one.